Last week was pretty quiet here on my blog. As I mentioned in my previous Fab Finds post, we had family coming to visit. Well, they left on Sunday evening and so I'm pretty much back to my usual routine now. Maybe I shouldn't say "usual" routine because I'm also in the midst of wedding preparations. Our third-oldest son is getting married in June. So exciting! The wedding and reception is out-of-state, but we will be having a wedding open house here where we live. More exciting news: in addition to the upcoming wedding in June, we have another wedding to look forward to. Our youngest son is also engaged. He's getting married in September. Our family is growing, and it's all so wonderful! Last week our daughter and grandson stayed with us while our son-in-law was on a business trip. Our son-in-law also stayed with us before and after his trip. We had lots of fun together. It was wonderful! I was able to spend a lot of time with our adorable grandson. During the week we went to the park, played with toys, read books, and just had a good time. Our daughter and I also spent time on wedding preparations, which I really appreciate. 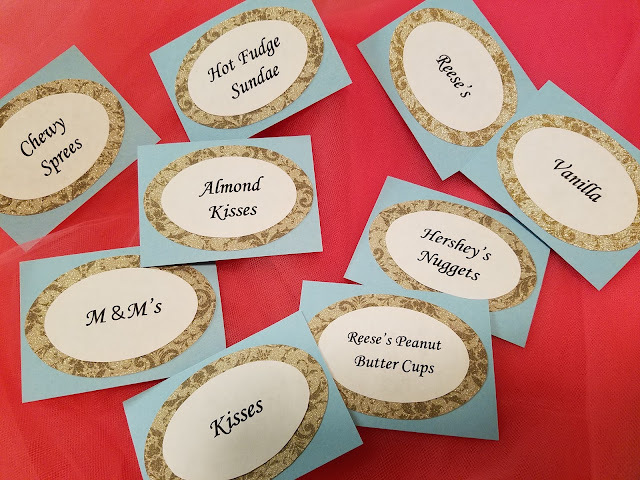 She is making the beautiful labels for the candy buffet and the cupcakes for the wedding open house in June. Our little grandson has me (Grandma) wrapped around his little finger. I mean, how can I say no to him when he says, "Up, up" while he reaches his cute little arms up to me? Of course I'm going to pick him up. Then when I do, he points to where he wants to go. We go to the pictures of family members and when he points to them, I tell him who they. We go to the curio cabinet and I name the various items inside. We go to the refrigerator because he wants to hold one or two of the pretty magnets there. 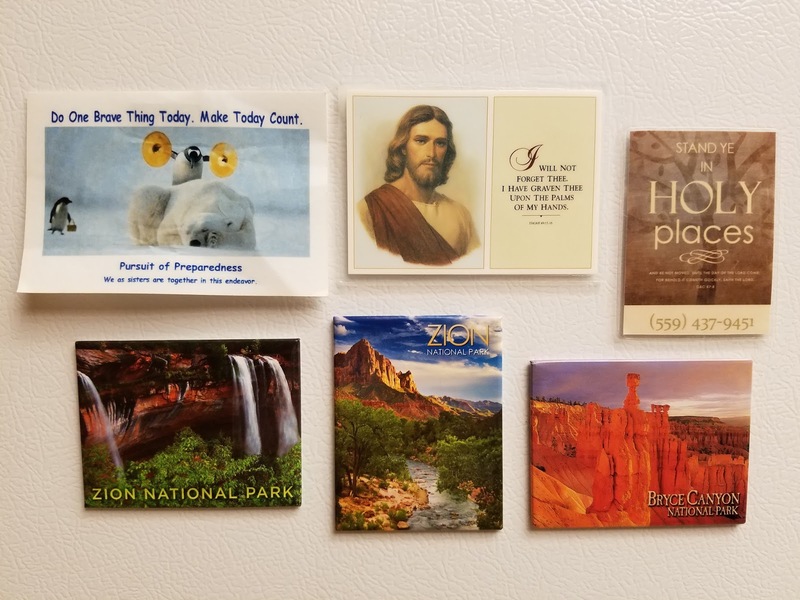 He especially likes the magnet with the picture of Jesus Christ on it. When we ask him who He is, he says, "Jesus" in his cute little toddler voice. If you've been following our home improvement adventures on my personal blog, Jana's Place, you may remember that we recently had carpet installed throughout our home. In preparation for that, we had to remove everything from the floors of the closets, everything from the curio cabinet, and everything from bookcases. It was a pretty huge job. There were boxes and pieces of furniture in our garage, back patio, and even in our kitchen/dining room area. The carpet has been installed and we have unpacked quite a few of the boxes, but we aren't quite done unpacking yet. So, that's another thing to do around here in addition to the wedding preparations. I began writing this post yesterday up to this point. This morning we received news that my sweet mother-in-law, Jean Last, passed away. She had suffered from Alzheimer's/Dementia for many years. She was 90 years old. I will share a post about her in the near future. She was an exceptional woman. So sorry about your mother-in-law, Jana. Peace to your family. There is not much that is "routine" about your life right now! That's a lot to juggle! I'm so glad that you were able to enjoy your daughter and grandson. Grandchildren are so much fun! I'm sorry for the loss of your mother-in-law. Prayers and hugs Jana!